Pineapple is a favorite fruit of many people because it’s tangy, sweet and oh so delicious. But did you know that pineapple is an exceptional healthy food with a number of good health benefits? Many healthy food options, including fruits and vegetables, are functional foods and pineapple is not an exception. Functional foods are consumed as part of a normal diet and are known to have physiological benefits and/or they reduce the risk of chronic disease. Functional foods contain bioactive compounds which make them healthy food options. Eating a variety of healthy food, including lots of fresh fruits and vegetables will provide many health benefits when eaten as part of a regular diet. Pineapples contain an enzyme called bromelain. 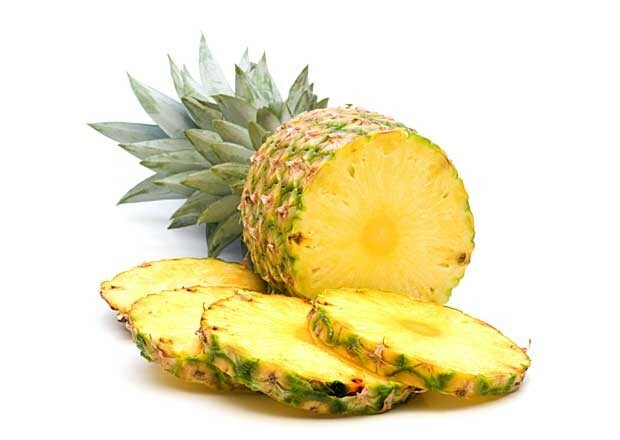 This enzyme provides the digestive benefits of pineapple by helping with protein breakdown. In addition, bromelain is considered to have anti-inflammatory properties and is believed to help relieve pain that is often associated with osteoarthritis. Bromelain is found in the stem of the pineapple, not the fruit part of this healthy food. It is therefore possible that taking a bromelain supplement in addition to eating pineapple with provide you with enhanced health benefits. In addition to bromelain, pineapples contain vitamin C. Vitamin C is an anti-oxidant that helps to prevent free radical damage. Additionally, Vitamin C helps to ensure that the immune system is functioning optimally. Pineapples are a good source of Vitamin A and beta-carotene which are both known to have anti-oxidant properties. Vitamin A is essential for healthy mucous membranes, skin, and vision. Pineapples contain manganese which is essential for the maintenance of healthy bones. Additionally, manganese helps with energy production and anti-oxidant defenses. In addition to manganese, pineapples contain thiamin (Vitamin B1) which also helps with energy production. Eating functional foods including a variety of fresh fruits and vegetables is not only delicious; it will help you support your overall health. Pineapple is not commonly allergenic and is easily digestible; for this reason it is often used in allergy avoidance diets. In addition, The World’s Healthiest Foods site notes that pineapple has practically zero oxalates or purines, substances that should be avoided by those with hyperuricemia, or gout. Pineapple, Ananas comosus, belongs to the Bromeliaceaefamily, from which one of its most important health-promoting compounds, the enzyme bromelain, was named. The Spanish name for pineapple, pina, and the root of its English name, reflects the fruit's visual similarity to the pinecone. Pineapples are actually not just one fruit but a composite of many flowers whose individual fruitlets fuse together around a central core. Each fruitlet can be identified by an "eye," the rough spiny marking on the pineapple's surface. Pineapples have a wide cylindrical shape, a scaly green, brown or yellow skin and a regal crown of spiny, blue-green leaves. The fibrous flesh of pineapple is yellow in color and has a vibrant tropical flavor that balances the tastes of sweet and tart. The area closer to the base of the fruit has more sugar content and therefore a sweeter taste and more tender texture. What Is the Best Fruit to Eat for Healthy Skin? Can You Afford to Look Like Jennifer Aniston?